We will see the second method now. 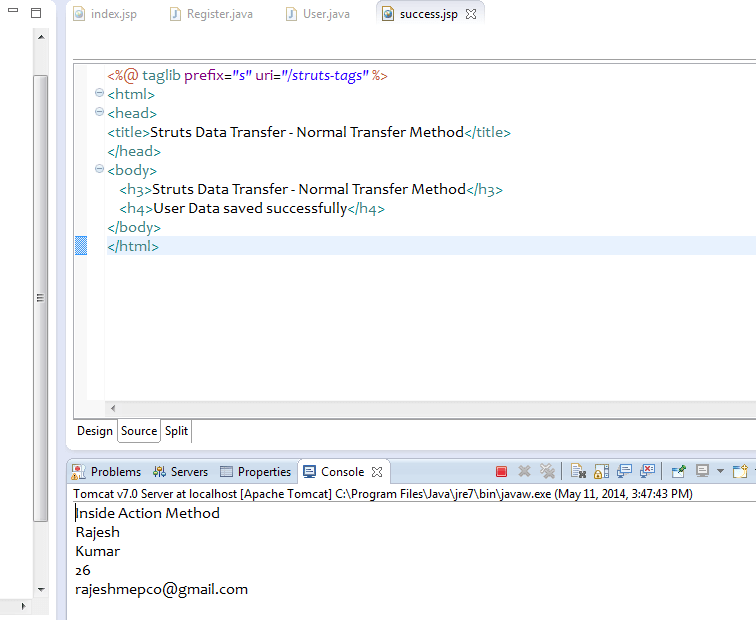 Create a simple jsp file index.jsp with struts2 form tags as below. The only difference from normal method and Object backed method is while naming the fields the name should be defined deeply. See below. The meaning of the above code is all the values will go inside the user object. So As per the above page when the form is getting submitted it will look for an action with name register. Now See our struts.xml below. In our Struts.xml we pointed the register action to register() method in the Register class. So when the form is getting submitted the control will execute the register() method. 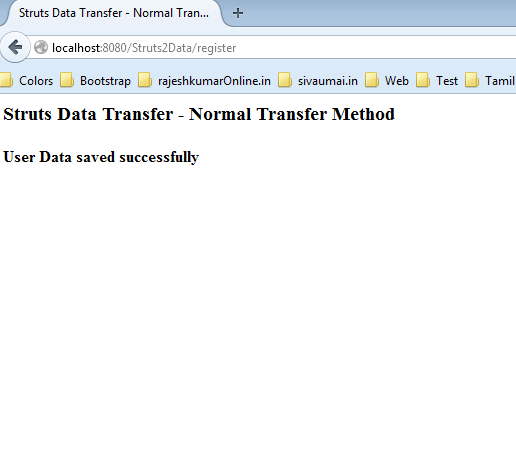 As per struts2 design the control will search the methods for all available data fields. In our case we named all the fields deeply like user.fname,user.lname. So the control will look for method setUser() in the action class that takes an object as parameter which have variables matching to the data fields. (i.e) An object contains lname, fname, age and email as members will be the parameter for setUser() method. Also the parameter object class should contains setters() and getters() method for required variables. So while executing the setUser() method the control will call the setters inside the User object for corresponding data fields. Now see our Register class and User Class below. 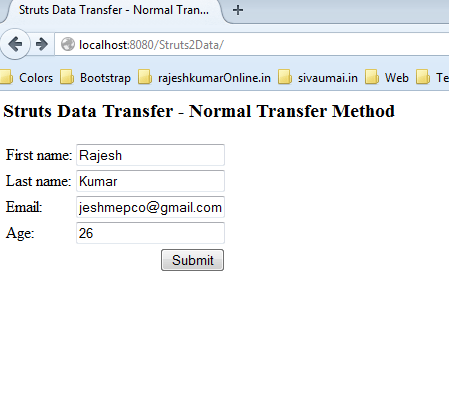 As we know the Struts2 framework will execute the setUser() method before executing the actual action method register(). So while executing the setUser() method it will call the setter methods inside the User Object. Here user.setLname(), user.setFname(), user.setAge() and user.setEmail(). So all the variables will be assigned to the user object. In our action method we just displayed the values in the console, then returning success message as result name. So as we mentioned the result page is success.jsp for string “SUCCESS” struts2 will load the page success.jsp to the user. See our success.jsp below. What will happen for those tags like <s:property value ="user.fname"/> . Struts2 will look for get methods in the corresponding action class. As we discussed earlier due to the name of the field it will look for method getUser() ninside the action class. As we have getUser() method inside the class it will return the object with all values. Then all the fields will be filled then returned to the user. We will see the first method now. In our Struts.xml we pointed the register action to register() method in the Register class. So when the form is getting submitted the control will go the register() method. As per struts2 design the control will look methods for all available values. In out case for fname,lname,email and age. It will search for methods setFname(),setLname(),setEmail() and setAge() respectively. Now see our Register class in below. As we have all the required methods, the Struts2 framework will execute all those methods before executing the actual action method, in our case register(). So after executing all the methods the control will go to register method. So all the variables are available now for operation. What will happen for those tags like <s:property value ="fname"/> . Struts2 will look for get methods in the corresponding action class. As we have all get methods getEmail(), getLname(), getFname() and getAge() in the action class those will get executed and the value will be placed there. Download the complete eclipse project below. Just import in eclipse by “Existing Project into Workspace” and run. To read java objects from action class as JSON object please follow the steps as below. To understand completely please read this article first. 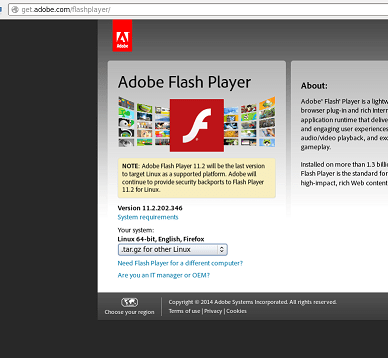 If your Firefox browser doesn’t play videos in youtube or any other flash content please follow the steps below to fix the issue.Go to adobe website https://get.adobe.com/flashplayer/ and download the flash player file with name ending .tar.gz. It will create a file called libflashplayer.so (See above screenshot). Then copy that file to users home directory/.mozilla/plugins folder. It can be imported like a normal script in any html page. See code below. Once the firebug installed while pressing the F12 button you will get a window like this.